Tap “Manage” at bottom and then tap “Sources“. Tap “Edit” and then “Add”. 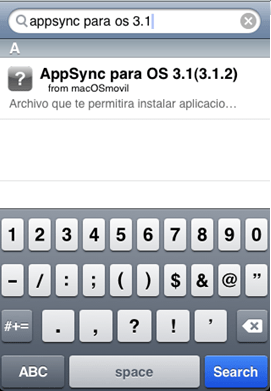 Then enter “http://apt.macosmovil.com “http://cydia.hackulo.us” and tap “Add Source”. Now tap “Search” at the bottom of Cydia and search for “AppSync” . The app for 3.1.2 works fine with 3.1.3. You can now install unsigned applications on your iPhone and iPod Touch. This will also eliminate error 0xE8008001. Superb….This has waorked for me.I was having problems in installing cracked ipa files on my iPhone 3G 3.1.2 with modem firmware 05.11.07. Both errors “0xE8008001” & “Application is not Signed” has got resolved after applying AppSync para OS 3.1(3.1.2) through Cydia.It doesnt even require a reboot. *Did not find Repository* any suggestions? Im getting the same Did not find repository… Help plz!! same error “Did not find Repository* any suggestions”????? Two Thumbs Up! This is very effective! After my iPOD Touch firmware 3.1.3 was jailbroken. I can't install my apps this message 0xe8008001comes up. After follow this simple instruction everything is up and running! Thanks a lot! how to do that if i dont have wifi? i cannot install .ipa files coz my wifi is broken, pls help me. ifunbox is a good way to USB connect to your device- you could probably figure it out that way. That hits the target petecfrly. Thanks! can i do this without wifi ? This one’s for you, Thanks. Can you sync those apps with an iPod which isn’t jailbroken? the new appsync for iso4 has release. is solve it = it solve my problem ! THANK YOU THANK YOU!! have ipod 4.3.1 and kept getting that 0xE8008001 error. installed appsync and no more error! Great! hi.. just wanna ask if those steps mentioned above to eliminate “error 0ex8008001” also works for an iphone 4 with modem firmware 4.10.01? please help me solve this problem. thank you so much in advance. more power. i got error “a server with specified hostman could not be found” what i do now,help me plzzzzz.